Beautiful artwork is created before your eyes while you listen to a powerful worship song, Who Am I (That You Would Die for Me), in this video featuring the music and artwork of Worship Leader Todd Vaters. You can also purchase a countdown version and a still of the artwork "The Victor". A lyric/chord sheet for the song is available through CCLI. Available in HD only (will not be letterboxed like the preview). Choose WMV, MOV or MPG at time of download. Actual video may vary slightly from demo and will not contain watermarks. 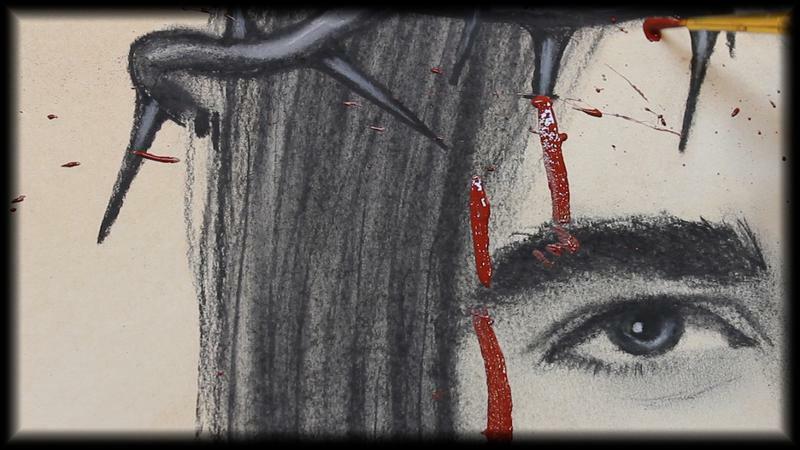 Powerful music and artwork bring the message of the cross to life. This video, featuring music and artwork by Todd Vaters, is perfect for communion and messages on the cross or God's love. A countdown version is also available along with a still of the artwork. Lyrics and chords are available through CCLI. This countdown is an artful depiction of the foundations of our faith and a great way to gather people in their seats with hearts ready to worship. It works well throughout the year and is especially appropriate for the Easter season. Available in HD only. Choose WMV, MOV or MPG at time of download. Actual video may vary slightly from demo and will not contain watermarks. Also available at SermonSpice.com where a UK version is included. The song Who Am I (That You Would Die for Me) by Todd Vaters is available on iTunes. A lyric and chord sheet is available through CCLI. This video is an artful depiction of the foundations of our faith. It works well throughout the year for communion time and for messages about the cross, salvation and the Gospel. It's especially appropriate for the Easter season.